So I decided to host another MM task competition since there haven't been any competitions for a while. Any skill level is welcome, and I encourage some people to try to pick up TASing with this. 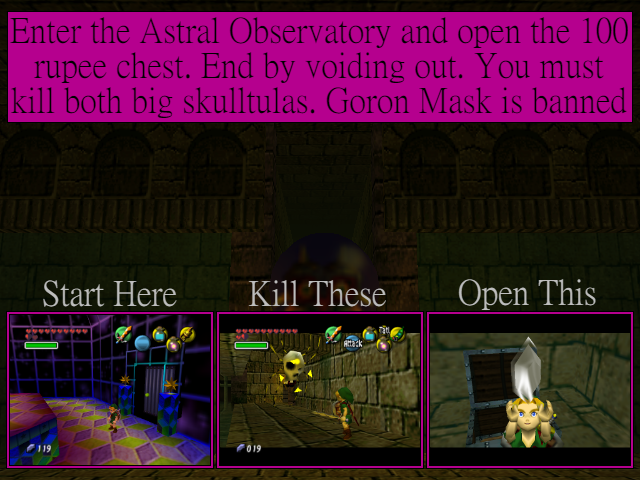 For these tasks, please use the U.S. version of Majora's Mask unless the task specifically states otherwise. I've come up with a simple goal for task 1. And here is a bizhawk savestate for this task. Do not purify the swamp. For this specific task, timing starts on first frame of control and ends on the final frame of the white flash when you kill the enemy. This task will be due on January 15th, 2017. If you need more time, let me know and we will try to work something out. It is highly encouraged to use bizhawk for this task (preferably bizhawk 1.11.0 or higher), although I do have mupen64 on my computer, so I can accept mupen submissions in case anyone really wants to use mupen for some reason. However savestates will only be provided for bizhawk and only for version 1.11.0 or higher. When you have finished with the task, please send an email with the .bk2 file (or .m64 and .st files) to Eumeus14@gmail.com. Please make sure your file is named such that it contains your username and the task number (ex. Eumeus_task1.bk2). For Bizhawk users: In order to play your movies, I will need to use the same settings as you. 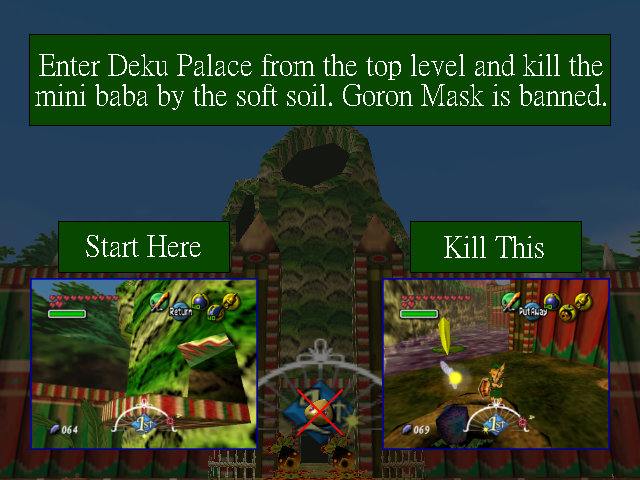 So under the N64 tab on bizhawk, please go to plugins and set core type to Pure Interpreter. Set Rsp plugin to Z64 Hle Video, and active video plugin to Jabo 1.6.1. It is also highly encouraged for your own sanity to go to Profiles under the Config tab, then set your profile to "Tool-assisted Speedruns". For Mupen users: Your video plugin should be Jabo's Direct3D8 1.6, your Sound plugin should be Jabo's DirectSound 1.6, and your RSP plugin should be RSP emulation Plugin. This is also on ZSR Forums. It has occurred to me that there will be people gone for AGDQ coming up, so I've decided to extend the due date to the 21st. It's a little late, but MTA created a mupen savestate if anyone wants on. And here is a bizhawk savestate. The c-items by default are garbage to encourage people to think about what items they want to use. 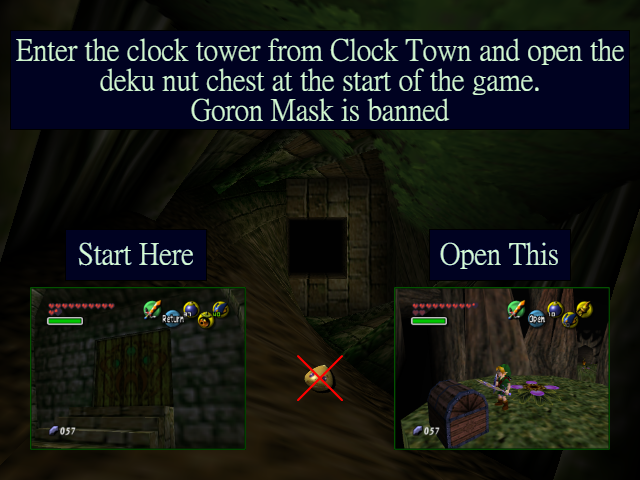 Timing starts on first frame of control in the clock tower and ends the first frame the deku nut is above your head. This will be due on February 18th. As usual, if something comes up and you need more time, contact me about it. Send the movie files to Eumeus14@gmail.com when you are done. Good luck and have fun, everyone! In case anyone is confused on how task 2 is possible, I made a demonstration video showing it being completed rta. Homerfunky made a mupen savestate in case anyone wants it. This task will be due on March 24th. Email your submissions to Eumeus14@gmail.com by then or contact me if you need more time and we will try to work something out. Timing starts on the first frame of control and ends when the final rupee is visible above your head. For anyone who isn't familiar with the layout of Pirate's Fortress, there is another way into the main area of Pirate's Fortress. 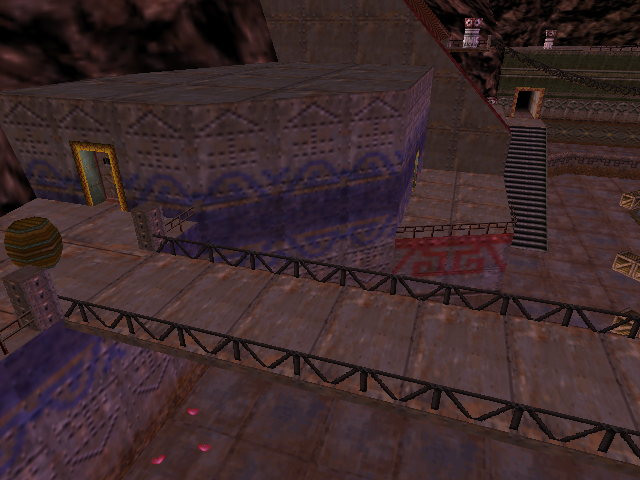 It is located above the entrance to the sewers over the surface of the water. What I'm considering to be the main area is the area that contains that watchtower, not the area with the boats. 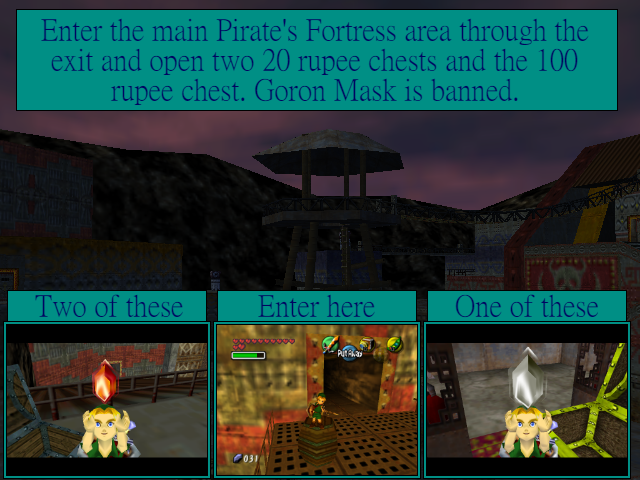 There are 8 chests in Pirate's Fortress which contain 20 rupees, and 1 that contains 100 rupees. I highly recommend exploring the area first if you don't know where they all are. If anyone has any more questions, please let me know and I will try to get back to you promptly. Good luck and have fun everyone! Riekelt and fullgrowngaming like this. This has been an issue in each task so far, and I didn't think it had to be overtly stated, but do not publicize your submissions until the compilation video for that task is up. The task 3 compilation is here! It is worth noting that you may NOT pop the balloon or blow up the wall beforehand. This task will be due on April 21st. As always, email your submissions to Eumeus14@gmail.com by then or contact me if you need a few extra days and we will work something out. Timing starts on the first frame of control and ends on the first frame the screen is fully black. Be sure that both of the skulltulas actually died before you voided out. You can test for this by listening for it to die, or by watching for the white flash to occur when you kill an enemy. If anyone has any questions, let me know and I will try to get back to you ASAP. Good luck and have fun everyone! Perhaps you should better define what you mean by void out. Initially I assumed a Deku void in the water by jumping on it is what you meant. Void out as in falling out of the bottom of the map or voiding in oob water or getting crushed. Just a void that brings you back to where you initially entered from. The task 4 compilation is here! This task will be due on May 20th. As always, email your submissions to Eumeus14@gmail.com by then or contact me if you need a few extra days and we will work something out. Timing starts on the first frame of control and ends on the first frame the heart piece is visible above your head. Be sure to contact me if you have any questions, and I will try to reply ASAP. Good luck and have fun, everyone! The task 5 compilation is here! Duping skulltulas or tokens is also banned. This is meant to be a very open ended task so I hope to see more participants this time so that there will be a lot of variety. 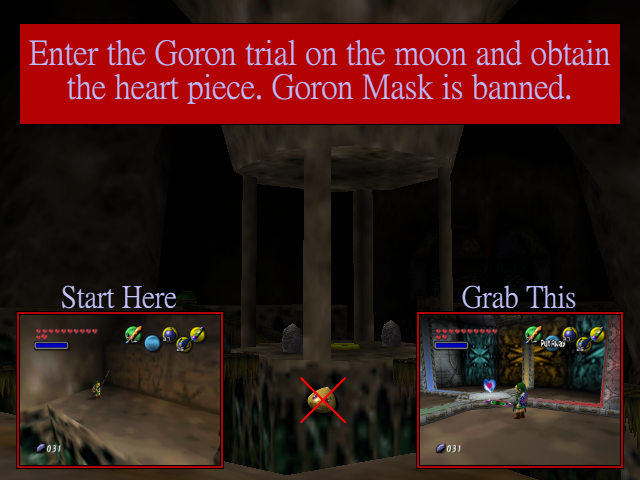 It's also a bit of a throwback to one of Grunz's old MM tasks. This task will be due on June 25th. Be sure to email submissions to me at Eumeus14@gmail.com by that time or contact me if you need a little more time and we will work something out. 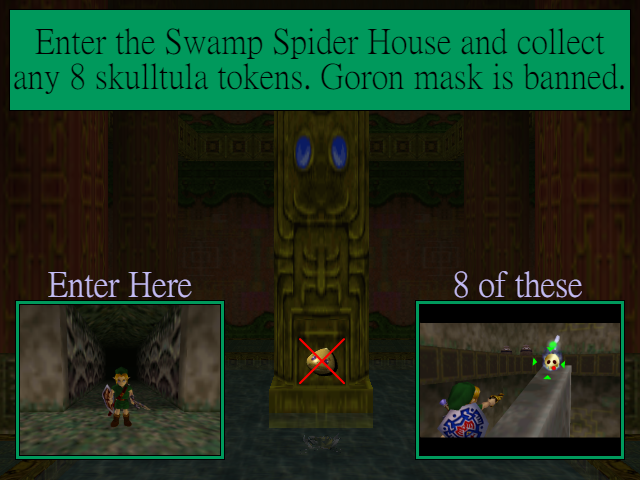 Timing starts on the first frame of control and ends on frame that the skulltula counter in the bottom-left changes to 8. If you do something weird and the counter ends on a different number, but you still got 8 different tokens, I will just end timing when your counter changes for the final time. Contact me if you have any questions and I will respond as soon as I can. Good luck and have fun, everyone! It has occurred to me that the bombchu script I wrote will probably be pretty useful on this task. If anyone wants to try it out, it can be found here https://pastebin.com/8gvJkR5y I'm not exactly the greatest programmer in the world, so if anyone tries it out and encounters any bugs, be sure to let me know about it. A lot of problems have been plaguing me... How do you make TAStudio start from a save state? How do you make an input happen on the next visual frame? It always happen 2 frames later, and with one of the plugins, it happens 3 frames later. I never use TAStudio so I can't help you there. Whenever you go to continue recording a movie the Read Only option will by default be turned on so you will have to disable it either with the menu or set a hotkey for it to continue adding input. sorry, for late reply. Sometimes SR.com logs me out without showing it so I don't get notifications. Anyway, I honestly don't have any idea what TAStudio is even used for, so I can't help with that unfortunately. But the inputs always happen 2 frames later. That's just how the game is designed. It's annoying to deal with at first, but you do get used to it in time. The task 6 compilation is here! 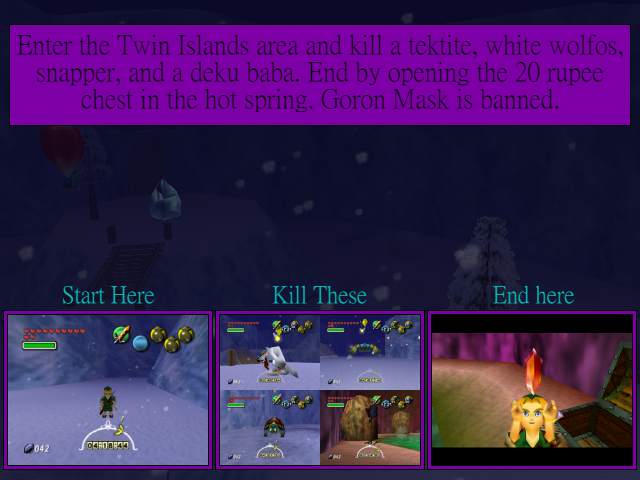 You must enter this area during the winter and you may not have affected the area beforehand (For example, you cannot melt the ice or blow up the rocks in the grotto before starting the task). Timing starts on the first frame of control and ends on the frame you see the red rupee over Link's head. Submissions for this task will be due on July 28th. Be sure to email your submissions to Eumeus14@gmail.com by then or contact me if you need a few more days and we will work something out. Also, this forum is now 2 pages long, and I did clarify some fairly important info on page 2, so please be sure to check that.